Initial Dismantling of the Berlin Wall. Image Source: PHBond. On this day in 1989, the East German authorities permitted their citizens to freely visit West Germany for the first time since 1961. The Berlin Wall was torn down twenty-one years ago in an atmosphere of tremendous optimism. The Cold War was finally over, and it appeared that the Eastern Bloc 'had lost.' That was how it was spun in the western media. "It is the moment in which East Germany collapsed and it did not do so alone. The entire post-war order, the splitting of the world into east and west, into two systems of socialist and capitialist, dissolves this night. It is the historical moment which marks the true end of World War II 44 years after the guns fall silent. There is hardly anyone tonight who does not feel this." BBC report on the fall of the Berlin Wall. © 1989 BBC. Video Source: Youtube. Dismantling the Wall at Potsdamer Platz. November 12, 1989. Video Source: Youtube. 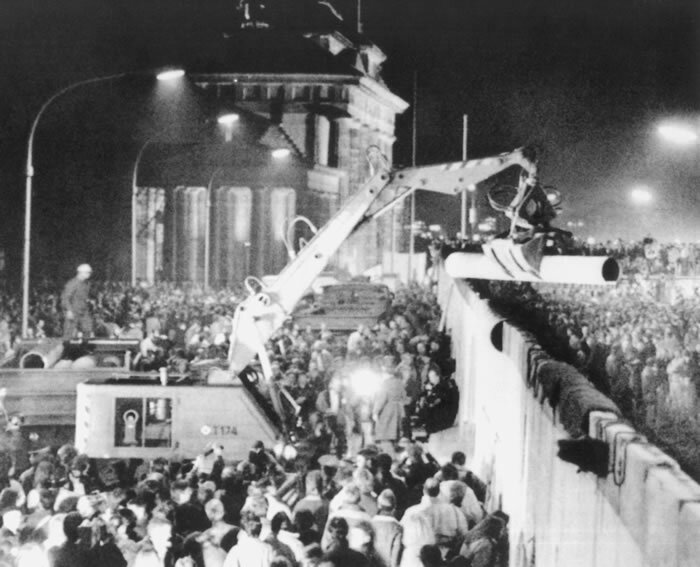 The ABC report on the fall of the Berlin Wall is at Youtube (here). The fall of the Wall, then, symbolized the delayed end of World War II and the end of the Cold War. German reunification in 1989 'healed' the country . During the Cold War, Germany's incitement of two world wars and horrific perpetration of the Holocaust overshadowed both halves of the still-occupied country. But the German nation's disastrous twentieth century turn also struck deep in the heart of what was once (and sometimes is still) called 'the West.' Germany betrayed herself, turned herself inside out, and destroyed her own legacy. While other European countries dubiously emerged from their own troubled imperialisms, it was the Holocaust back on the continent, as well as the two world wars, that constituted the real watershed. These were signs that the European tradition had taken a broken path. Something had gone terribly wrong. Two films at the beginning and the end of the period when the Wall dominated the Cold War consciousness are noted for capturing that feeling - that something had gone wrong across the West. First, the film adaptation of John LeCarré's 1963 novel, The Spy Came in from the Cold, starring Richard Burton and Claire Bloom, featured huge dramatic scenes around the Berlin Wall, which demonstrated what the Wall meant when it was first erected. Bookending that, there is Wim Wenders's famous contemplation of a divided Berlin in the late 1980s, Der Himmel über Berlin (Wings of Desire), with its grey angels who haunt and seek to comfort a haunted, divided city. The angels follow, then walk through, the Berlin Wall. Der Himmel über Berlin (1988). Video Source: Youtube. Finding a way back from delusion, from that terrible defeat, from that genocide, that's what the fall of the Berlin Wall represented. It wasn't just a reconciliation for the divided Germans. It was a moment in history that suggested that hope could be rekindled. Of course, it was not so simple. As a result, there's now some nostalgia for the old GDR and that lost Cold War period. Pink Floyd: A Great Day for Freedom from The Division Bell (1994) © EMI. Reproduced non-commercially under Fair Use. Video Source: Youtube. Pink Floyd's 1994 song, A Great Day for Freedom, described the heady optimism as the Wall came down, followed by the sobering realization that the optimism could not last: war and ethnic cleansing erupted in the former Yugoslavia from 1991 to 1995. Amazing times. But it was all a deception foisted upon the West to put us to sleep. We never won the Cold War. Read J.R. Nyquist's "Origins of the Fourth World War" and especially Golitsyn's "New Lies For Old", in which he stated that the Soviet Union would reunify Germany, and perhaps even tear down the Wall, as part of a long-range plan to introduce "false liberalizations" in the satellite countries. Whether or not the "plan" was adhered to letter by letter, the overall effect in achieving the goal of the long-range plan is within Russia's reach: unification with Europe, and a final victory over the West. "Rocket Day" gets closer and closer, as Obama strips us of our nuclear deterrent. The history of mankind is the history of war, not peace. East vs. West; Civilization vs. the Barbarian. The rise of the Barbarian is about to commence, and the "civilized" West has lost its will to fight, along with the realization that the warrior never really disappeared. @Marko, Thank you for your comment. I would agree that the notion that 'we won the Cold War' was illusory. As for what will happen with Europe and Russia, a cursory glance at a historical atlas will tell you that Europeans have been fighting for and against pan-European initiatives for almost as long as Europeans themselves have existed. So another big European conflict (whether on the continent or transported elsewhere) is pretty much inevitable. My sense of these polarizing debates, whether they be 'east vs. west' on the one hand or Post-Colonialism or radical Jihadism on the other, is that they are extremely seductive. But they do not get at the heart of what is happening. We are, all of us, facing huge changes from the tech revolution, as well as a host of other factors - globalization, turn of the Millennium, unprecedented travel, scientific breakthroughs, information revolution etc. I think these changes are causing extreme cultural stresses internationally. The truth of human history is not one of inevitable war, but rather of inevitable swings between war and peace. There are times when people from very different societies live in harmony. Then they can suddenly flip and be at each other's throats for decades or even centuries. That doesn't erase their earlier ability to live in harmony. I agree that a polarizing ideological climate may well lead to a widespread war. But that doesn't mean IMO that the polarizing ideologies explain what is happening. I think they are symptoms - not explanations. There are deeper forces at work here, especially the fact that we are living through a massive technological, informational and scientific 'jump.' In the past, that kind of jump has always been accompanied by decades of conflict, the rise of religions, the rise of empires. This song is optimistic or pessimistic ?